Below is the 24 hour gold chart for Wednesday, Thursday, and Friday of this week. Notice the 40 dollar rally? Normally, this type of rally leads to some type of short covering, as investors who made bearish bets cut their losses and close out their positions. 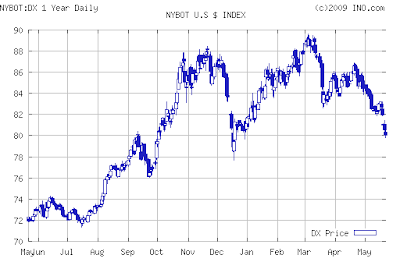 Next is a one year chart of the USD index. Notice the dollar breaking down? This is very bullish for gold. Normally, a very bullish development, such as the dollar's current freefall, would lead to a decrease in bearish bets against gold. Despite what one might normally expect, open interest on the COMEX did not fall. In fact, it rose by 22,992 contracts in two days. That is 65 tons in just 2 days. Last March, open interest in COMEX gold increased by 1,209,600 ounces in the two days after the fed announced its plans to double its balance sheet. This is worse. So then, who sold 65 tons (2.3 million ounces) of gold on the COMEX in the last two days? Where did this 65 tons come from? Why sell it now, as gold soars and the dollar crashes? The only logical answer is that this is a blatantly obvious attempt to keep gold prices in check. The 65 tons of gold was conjured out of thin air. Conclusion: There are two key points to take away from this. 1) Despite the best efforts of gold shorts, physical demand is driving prices higher. The 65 tons of paper gold sold on the COMEX was to absorb as much investor demand as possible, keeping it out of the physical market where it would send prices upwards. 2) Such obvious attempts to suppress gold prices are a sign of desperation. Each new piece of evidence of manipulation pushes new investors into the physical gold markets, which can't be controlled. So while shorts on the COMEX managed to absorb 2 billion dollars of gold demand, they also provided near indisputable proof that the COMEX gold market is rigged, damaging faith in the US financial system. So, is there ANY way at all to find out who is selling this "paper" gold? I found an interesting (and long) article about how gold ETFs work. I can't say I've entirely digested it all yet. I also found another interesting article about how the LBMA is possibly planning to use central clearing instead of bilateral clearing. I can't help but feel this would be a bad thing.. probably used to help conceal bad actors. One final thought regarding 'allocated' gold accounts. The idea is that when you buy the gold you get a serial # of your bar back. But since the gold could be located at the end of a long chain of sub custodians.. the guy who sold it to you has never seen it and noone ever will unless you explicitly ask for it to be delivered. But what's to stop one of these sub-sub-sub custodians from just making a list of serial numbers that they've given out and if someone ever asks for their bar - they can just stamp one out with the right number. What will happen when on a certain imaginary day the US defaults and the DJ goes to 4000? Someone sold 650 tons or perhaps 6500? We will be discussing the same email but then perhaps an amount 10 or 100 times bigger. And gold goes to 650 or maybe 400. And nothing we can do about it? Are there no whistle blowers in the COMEX/banking industry? Is there no help out there? We're running around in circles. I don't understand how paper gold can push down physical gold price down. Eric, I'm finding this persistent paper shorting a little disconcerting. Could it be the Powers That Be know some inside info that we don't? Like maybe Japan forgiving USA's debt? The price of gold isn't rising because of some mass awareness of the supply/demand fundamentals of physical gold or even the industrial properties of gold. There is a primary cause for this rise in price of spot gold and I explained it before and the cause is Credit. The answer to what causes the spot price to rise is: defaults with no available cash(credit) to cover up the default. This is what has been causing the spot price to rise: the credit crunch. No available dollars to mask the defaults, which causes a decrease in the supply(although artificial). I'm sure there are investors in paper gold that are not even recieving the cash settlement let alone the physical gold. In the same way banks are having trouble supplying depositors with their demand, the gold market is having trouble doing the same as it is this same base money that is used in settlements and that base money has become more unavaiable and it's not because of a mass increase in people demanding deposits or demanding delivery of physical gold. These bankers thought that Fractional Reserve Banking can go on forever since not everyone will come at the same time to demand their deposit but by extending credit much larger than the supply of base money, the bankers are in fact making that happen and digging their own graves. Unfortuantally for the bankers, in order for banking to survive credit must continue to be extended. The more credit extended the more liquid the credit/banking system looks. So what the bankers had to do to survive also killed them as extending credit was both the tool to keep the system alive but also forced it to a stop as the base money was stretched to thin and could not keep up with the expansion of credit, thus credit contracts. The people running the gold market had the same thought for those who demand physical delivery. First they did everything they could to discourage demanding physical delivery and got those who actually do demand physical delivery down to a small percent. They thought that this small percent of people who demand delivery could not cause massive defaults, but they overlooked how they infact helped this small percent of people demanding physical delivery cause massive defaults. They helped by over leveraging the market so much that even the demand of that small percentage was too much to ask. The same way there are bank failures happening, not because allot more people decided to start hoarding the Fed Notes themselves(no one is really doing that), it happened because the debt for the base money grew so large that it became difficult to supply depositors. This isn't some mass awakening. Most people aren't hoarding any physical gold or even Fed Notes. The people hoarding physical gold/silver are still in the minority of people the same as the people hoarding Fed Notes, they are in the minority. The rise in price is still due to that minority demanding delivery and the enormous debt that has made the seemingly easy to produce paper currency(at current denomination cap levels: $100 bills) difficult to produce. We have not even begun to see real demand for physical gold. Gold hoarders are still in the minority. This rise in price is mainly due to the rising inavailability of base money. This base money acted as the physical gold and as the base money became inavailable the plan backfired as the base money playing the roll of gold to make gold look very available failed and eventaully the base money itself became less available. This less availability of basemoney is called the credit crunch. This rise in price of spot gold that you are seeing is not because of a less availability of physical gold, it is becauase of a less availability of base money(Fed Notes). And physical gold is a hell of allot more unavailable than base money(Fed Notes) so if the price of spot gold were based on the availability of physical gold, the spot price would be a hell of allot higher. When credit collapses we shall start seeing the price of things being based on their physical supply/demand fundamentals instead of the supply/demand fundamentals of base money(Fed Notes). People are not going to be settling for the paper anymore, they are going to want the physical gold. The paper will be worthless even though it's so unavailable and you know why, because companies that sell things rely on borrowing this unavailable base money and in order for them to make the money to pay the rising interest on this unavailable base money, they have to raise prices of their goods and services just as severely as the base money is unavailable. Physical gold could never allow itself to become so available to get in to the kind of debt Fed Notes got in to as physical gold is no where near as easy to produce as Fed Notes and so if bankers tried to use physical gold as money defaults would happen very quickly and gold would be in allot less trouble than the dollar is right now as gold wouldn't have so much debt on top of it. This is why bankers dislike physical gold. Physical gold(or anything difficult to produce) does not work with banking. Things that are hard to produce are for hoarders not bankers. But credit itself breeds hoarders as the expansion of credit causes even the most seemingly easy to produce thing(paper) to become difficult to produce. Wow that was too long. Numonic, if what you say its true then gold should be in backwardation. After some thought perhaps the backwardation stint we saw late last year in POG might have given an early signal to the monetary bases supply/demand ratio. That is precisely what Professor Fekete said about the coming backwardation in his interview with the Daily Bell. Secondly,Numonic has touched on something that has been niggling at me watching the gold trend over the last 12 months. I have recently sold my home to avoid the coming collapse of house prices (still artificially propped up by the first home buyers stimulus here in Australia ). Wanting to diversify and not hold the total sum in a bank deposit ,I have been thinking to invest in some physical Gold to about a third of my funds but haven't made a move yet out of worry of a possible hidden agenda behind all the manipulations that I see no one consider in their blogs,every where it's buy now ,buy now before the price goes exponential. WHY would the PTB behind these manipulations KEEP TRYING so obviously to suppress the price of Gold,right out there in the open when bloggers and advisors are screaming to the world at large to buy now .Surely common sense says they would have already saved themselves if that is what they are doing ,buying time to protect their own investments etc,why risk causing a big rush now when so many people are watching ( many like me who never cared two hoots before about gold or stock markets! ). Something just doesn't add up to me about the whole scenario . Has anyone considered they might be thinking in a whole different way , and their manipulations are actually being done intentionally, for totally different reasons than anyone might expect ,done to create exactly the environment that we have now ? I am worried that the end game is not toward keeping the price down now until they cover themselves from financial failure or whatever, but to actually ,in some way , for what ever reason , be acting toward collapsing Gold as a century old reliable standard down the track, removing it totally from the equation as a safe haven, thereby starting a whole new paradigm in the way we perform commerce once the dollar collapses ? But my question to both you Eric , and Numonic is ;do you think there could be way more to it all than anyone is seeing? Have you ever sat back on the fence and examined it all from a conspiracy angle ? My intuition is telling me something stinks in the state of Denmark, there is more to it all than meets the eye, and I am very nervous about whopping out a large wad of my life's savings to find the end result is the opposite to what we all expect to happen (Gold rising 500% or so), and I end up losing my life's savings instead of gaining or protecting them. SOMETHING JUST ISN'T RIGHT ABOUT ALL THIS!! Since manipulation is the name of the game these days (decades) whether in media,government or corporation when it comes to we the populance ( or to use their degrading term for us , "consumers"), is anyone examining what their potential aims by suppressing Gold prices could be ? I would so love to see you write a blog on the conspiracy angle of what might be going on with it all. Between your analysing skills and excellent research , and the thoughts of your peep's here in comments , what might we find, if anything? I really need to make a move soon with my money, and this intuitive suspicion is holding me back from making the phonecall and ordering a swag of coins. The other niggling worry I have also is the fact that the government have a constitutional right here in Oz to call in all Gold if they choose. How would I stand if they ended up doing this and I have to hand over any Gold I have to the government,How would I be compensated ,would it be fairly with the market price at the time? PLEASE write the conspiracy blog!!! cheers mate, you do a wonderful, wonderful job. sorry about the length of my previous post ! Oz the manipulations are only so obvious now because they are coming to an end. People didn't notice price fixing until it was on their block corner in bread lines but the fact is "credit" is price fixing just on a global scale. If you stepped outside the planet and looked at the world over the past decades, you would see breadlines all over, especially one leading to China. Oz you're asking why do they supress the price of gold. That's easy, it's to make the paper currency seem more valuable than it really is so that more people will hold the paper currency as apposed to gold. They don't want people holding gold because gold and banking can't work together. Gold is too difficult to produce to stop inevitable defaults that would end the banking system. And their goal is to keep the banking system alive. It is a sort of control. Now they don't want people to hoard the paper currency either, they want the system of letting someone else hold your money for you to continue. Which is why they expand credit as much as they can. So that you can have trust that if you let them hold your money, they will be able to pay you back. If they are spewing out trillions of dollars(with credit), you will feel safe in letting them hold your money because you will see that they have so much money that they can give it away so freely with no problem. You will trust that they will be able to give you your money back plus interest with no problem. This massive expansion of credit is like bait in order to get you believing that storing your money with them is safe as they have so much that they can give their money out for free and because of that you see no chance of them not being able to give your money back with interest. They can't pull this off with gold as gold is allot more difficult to produce than the paper currency. You see it's more an issue of hoarding VS lending than it is Gold VS paper. If physical gold were as plentiful and easy to produce as the paper currency they would be using gold with banking, so they have nothing against gold except the fact that it is rare and hard to produce which can't work with banking. They don't want hoarders, they want lenders. Because hoarders are those who do not trust others with their money/belongings, they want your trust. Having your trust is a form of control and they are all about having control. That's what i think banking is about: control. But now that banking is coming to an end, they are loosing their control and we shall all become hoarders(well at least those with half a brain). Anyway this transition from a world of lenders to a world of hoarders will create prosperity throughout the world as it will lead to more exploration and production which was being discouraged in a world of lenders. The only way they can do that is if they had massive amounts of tons of physical gold in secret somewhere and just brought it out to the market. But if they had this secret gold, they would have already used it to supress the price of gold instead of going through the trouble of naked shorting the gold market. In fact they wouldn't have gone off the gold standard and physical gold would still be used as their currency. What you are witnessing with this increased attempt at supressing the price of gold is that supression coming to an end as the price is continuing to rise even with greater attempts to supress the price. It's like they are flooding the gold market with paper but the defaults are outpacing the massive amounts of paper they are throwing at the gold market, the same way all these bailouts are not enough to stop this credit contraction and what is needed is Zimbabwe size bills. But I explain in previous posts how the creation of larger bills will make the credit contraction worse. As the creation of larger bills is a sign that the govt. has lost control of the credit contraction and this will increase the fear in holders of our debt that we will default on our debt thus causing holders of our debt to sell the debt as quickly as possible to avoid being the one to get defaulted on and this selling of debt is increased demand for already incredibly unavailable Fed Notes, thus exacerbating the credit contraction. "Don't worry about confiscation. Here's why. The govt. and banks would love nothing more than for a glut of gold and silver to enter the market. Why? because this would bring the price of gold and silver down in relation to the paper currency. The thing is the only way to get more gold and silver on to the market is to mine more gold and silver. Unfortunately there is a cost to mining the gold and silver. That cost would raise the price of gold and silver which would defeat their purpose of mining more gold and silver. They need a way for more gold and silver to enter the market without anyone having to lift a finger to bring it there. Because it is this "lifting of a finger" that is the cause for the price of gold and silver rising. So what they do instead is to deplete the above ground silver and gold(the gold and silver that our ancestors mined) and they naked short the gold and silver market to hide the cost of mining the silver and gold. In order to naked short, you'd have to be able to give away dollars(the currency). Another unfortunate for the govt. and banks is that that ability to give away dollars(the currency) is going away as the enormous $1 quadrillion debt is deleveraging and the dollars(physical currency) in existance are all being called in to plug holes to stop defaults, as this same technique they used to keep the price of gold and silver down has been used on everything else in the world. This technique goes by the name of "credit" and it is price fixing. Credit has been keeping the price of everything produced lower than the true cost to produce those things. The task they had was to keep the price of everything low by using credit. It worked for some time with a few bumps(recessions) in the road but now it has reached a road block that it can not pass. The task of keeping every product in the world under the cost of production is too much and it has failed and now the true cost of production of many products will be exposed as the mask of "credit" is removed. The obvious reason they wanted to keep prices down was for the benefit of the currency, it was to make the currency look more valuable but in reality the cost of producing the currency is allot cheaper than the cost of producing many other things on earth. The conundrum was that in order for the banking system to continue, the currency had to be easy to produce, otherwise when defaults loomed from the massive debt that needed to be issued to assure trust in people to put their money in the bond/banks, the currency wouldn't be able to be produced fast enough to stop defaults and default is death to the banking system. The govt. and banks want to save the system of banking which is why they moved from using gold in banking to using only paper as gold was too difficult to produce to stop defaults and thus gold and banking would make a short life for the banking system where as paper and banking would keep the banking system alive much longer. Unfortunately for the bankers, even the seemingly easy to produce paper currency becomes too difficult to produce when the debt reaches such a high level and thus the paper currency is unable to stop defaults. Fortunately for the world, the wealth that is burried in the earth is practically untouched because of how credit has had us just scratching the surface of the earth for it's goods and there is a bunch of wealth in the earth waiting for us to bring it to the surface. so celebrate the beginning of a prosperous world. Numonic, i do mostly agree with you: government/banks are not to serve the people but to control/drain them. The system is trying to keep peoples' dependency, so gold role in the system is refused by government. But if i'd be government in Western country, i can do whatever, i can prohibit owning a gold, i can tax selling the gold by 90% tax, so it will become worthless for people (in my country, if you sell a property like house/flat, you pay 3 % to government). I can imagine, most of the people ('most' like perhaps all) will celebrate such move: first they will not loose (but some others-rich! will), so they can even think it is right move, second they are not too smart to catch the idea what the play is playing. I mean that's how people think, it doesn't matter if there is a collapse. I fear great collapse is not great opportunity for the people as you suggest, but for government, i mean some communists and so on. Government/bankers are not going to give up their power, they are going to take opportunity again and i am not sure people are capable to refuse them. The issue of paper money is not that government wants to control people in some evil way. In truth, paper money is issued in order to secure the well being of the greatest possible number of people. Right now, under the Dollar fiat standard, there is a huge number of people (in the millions) who survive without having to work. That would be impossible under the gold standard. In a gold standard, only those would be able to eat who do valuable work. Too many people today do not have any marketable skills. They can survive only thanks to government control of money and production. To repeat: We need fiat money and government regulation in order to fight widespread misery resulting from the lacking ability to compete in the economy. Since i'm from country, where communists were the sole party for 40 years, i'd like to leave a note on that. It was similar to North Korea today. In short..
+ and so on (of course all that people above were arrested/tortured or even killed). No doubt what was going to happen if you dared to criticise the sole party, even in a pub. And here comes the point. Although it were terrible years, according to survey from 2007 only one third thinks better times are today. Btw. the same people from government practising socialism were/are practising free market then. So here comes my fear what can happen, if even in my country (where people have terrible personal experience) are still able to admit such era. May 25, 2009 7:41 AM"
That is the most communistic BS i ever heard. You're basically saying that the only people who use credit are those that can't work for what they want. You know that that is not true. Banking/Credit infact breeds these very people you say need the government. And you're also basically saying that there would be no retirement for people if hoarding were practiced instead of banking/lending. This is also very false. In fact if hoarding were practiced, more people would be retiring allot earlier than they are/would with banking as hoarding is someone practicing better care of their store of wealth which is the best way to store your wealth and leads to prosperity. When credit collapses, the true price of things will be exposed and this will lead to more exploration and production which will feed and supply many more people than the breadline of credit did. And we have a larger population now than before that will make that job of production/exploration easier which is why this increase in population is a good thing not a bad thing. Credit has been discouraging this increased population from exploring/producing. When credit ends we shall have a booming economy in the world as these people frozen by credit will be freed and more exploration/production will be done. Enough to supply those that can't do it for themselves. Stibot any tax like that on gold sales will just drive gold sales to the blackmarket, which by the way is one of the attributes of money. And their rule is ending. Their tool was credit. Credit is how they lured people in but now that credit is ending, they are loosing their power. That's all there is to it. How likely is it for the US government to confiscate private gold and silver? Most Americans would like the idea to confiscate gold as they are poor and like/need communism to survive a few years longer ( no marketable skills, no motivation to work hard, etc). It is highly unlikely the US Govt. or any govt. will confiscate private gold and silver. Because doing that will only make gold and silver more rare and increase the value of gold and silver. Plus it would be too difficult. How would they know who has the gold and silver if it is private? They can't know. Confiscating gold and silver goes against what they are trying to accomplish. They want more gold and silver in the market, not less. It would serve no purpose to confiscate the gold and silver to pay off debt as this would cause the price of gold and silver to sky rocket. Their only tool was "credit" and now it's coming to an end. I disagree with the idea that most Americans would like the idea to confiscate gold. I disagree that most Americans like or need communism to survive. It is communism/credit that breeds this lack of marketing skills and lack of motivation to work. When communism/credit ends you will see these people who were discouraged to have marketing skills or discouraged to work become encouraged to work and show better marketing skills. And this will bring prosperity to the world. Everybody everybody take delivery of your paper gold if you try and rationalise the actions of these Criminals you will get burnt. It`s high time to Bail. Also about confiscation. You know the govt. is more afraid of and dislikes people hoarding Federal Reserve Notes more than physical gold. Here's why: The govt. uses these Federal Reserve Notes to drive the price of gold and other things down. If there is not enough Fed Notes, they have trouble driving the price of gold down, along with the price of everything else. So I'm saying if you want to end this credit/price fixing charade and bring inflation sooner, start hoarding your cash ALONG with your physical gold/silver. Hoarding Federal Reserve Notes or any currency of any nation makes it harder for the banking system and brings inflation sooner. Plus you might as well hoard your cash, I mean there's a great chance of you loosing that cash in someone else's possession(i.e a bank) through massive defaults that I see coming. If you're worried about confiscation, worry about Fed Note confiscation through bank defaults and ultimately rising prices, not private physical gold/silver confiscation. I said this before, the banks and govt. 's would love nothing more than everyone to stop withdrawing Fed Notes from banks as the banks have a hard enough time as it is circulating those Fed Notes around to try to stop defaults. Taking delivery of your Fed Notes and hoarding them makes that harder for them. But the number 1 reason to do it is so that you avoid loosing your bank account through default which I see as very likely(even though they are printing Fed Notes like mad). But most of what you hoard should be physical gold/silver. If you hoard any Fed Notes, it shouldn't be for savings, just for short term spending, like a weeks worth of Fed Notes at a time while the majority of your savings/hoarding should be in private physical gold/silver. In fact it is more the action of taking delivery of Fed Notes than it is taking delivery of physical gold/silver that causes the price of gold/silver to rise. But remember, even though you see the price of spot gold/silver rise DO NOT put your money in paper gold/silver because the reason for the rise in price is defaults, that means people are not receiving anything for that paper gold. And when i say anything, i don't mean they're not receiving the physical gold, i mean they are not even receiving the Federal Reserve Note settlement worth of the paper gold. The paper gold becomes illiquid. So even when spot gold is $3000/oz, there will be many of those holders of that paper gold that will not be able to get $3000 or anywhere near $3000/oz for their paper gold, simply because the reason for the price rising that high is a shortage of Federal Reserve Notes. So if you think that when spot gold is at $3000 that your paper gold is just as good as physical gold, think again. That paper gold will have a face value of $3000/oz but it will be worth the intrinsic value of the paper contract as it will be an illiquid promise to pay $3000 in Federal Reserve Notes where as the physical gold will be worth it's intrinsic value(which includes all it's industrial uses, it's durability and it's rarity). So take delivery of the paper gold and when you get the Fed Note settlement from the default to deliver the physical gold, hoard those Fed Notes if you need them immediately or if you don't need them immediately buy and hoard physical gold/silver with them. Basically keep no savings in dollars except for immediate( a week's worth) of purchases. Or keep cash for obligations. On a personal note: like for instance: I'm leasing my vehicle and the lease is up in Jan 2010 and I guess I plan to buy the vehicle. So I have cash saved up awaiting that purchase(actually in a bank CD gaining puny interest, so I'm contradicting what i just said above). But the reason I still have some money in that Bank CD is because of an influential person in my life who doesn't quite understand what risk it is to keep that money in the bank and gives me hell when i don't add money to it let alone take money out. So I'm still battling that. Soon I will become a full blown hoarder. This is my first vehicle(don't ask me why i leased it) but I'm thinking of keeping the vehicle. But my outlook for Jan 2010 is grim(as far as the economy and gas prices and all) that I'm questioning purchasing this vehicle. I'm really thinking the $hit will hit the fan by Jan 2010 but it's a good vehicle and I think it will be useful in this coming credit collapse environment(even though it's only like 30mpg of gas.) I don't know, I'll see what I do when the lease is up, I have the money to buy it saved up(although in a bank) right now and I have until Jan 2010. Cheap wow gold in cheaperzone. buy Wow Gold championship GP. cheap wow gold in cheaperzone.com? wow gold you will like. Aion Kina or legal weapon. aion kina of Pu Dream Team. cheap wow gold one of the current. aion kinah please in g4paion. aion gold was actually for. cheap wow gold was actually for. Cheapest wow gold you knows. wow gold Cheap all in cheaperzone.